Andy's flight was scheduled to depart Miami International Airport at 6:00am this morning. We decided to just stay up after the parade last night and drive up to drop him off. We departed Key West at 2am and made decent time to Marathon - usually at least an hour trip I made in 45 minutes. Unfortunately the trend did not continue and we pulled up to the airport at 5:24am. Andy hurried to the gate but they told him it was too late to make his flight. We were already about a half hour back down the turnpike but turned around to hang out with him until he could get info on another flight at 8am. Scott and I were both exhausted, so we ended up sleeping on the floor in the airport while Andy waited to find out his fate. Originally when they told him he had missed boarding his flight, they told him his only options were to wait until 8am to find out if he could get one seat on one flight scheduled for 11am or catch a flight from Fort Lauderdale for $750. At 7:45am he went back to the ticket counter to plead his case and they found him one seat on a flight out at 1:29pm and charged him a $75 changed flight fee. He checked his bag and received a boarding pass for flights all the way through to Portland. We got back in the Honda and headed down the Keys. We made it back home about Noon today and then sacked out for about 6 hours. Thankfully I have tomorrow off as well to recuperate. It's a silly word, but I like Jill, so I'm gonna do it. My great8 grandparent is Pharyngula. My great7 grandparent is Metamagician and the Hellfire Club. My great6 grandparent is Flying Trilobite. My great5 grandparent is A Blog Around the Clock. My great4 grandparent is archy. My great3 grandparent is Why Now? My great2 grandparent is Over the Cliff, Onto the Rocks. My great-grandparent is Notes From a Transitional Fossil. My parent is South Bay Soliloquy. There are a set of questions below that are all of the form, “The best [subgenre] [medium] in [genre] is…”. Copy the questions, and before answering them, you may modify them in a limited way, carrying out no more than two of these operations: You can leave them exactly as is. You can delete any one question. You can mutate either the genre, medium, or subgenre of any one question. For instance, you could change “The best time travel novel in SF/Fantasy is…” to “The best time travel novel in Westerns is…”, or “The best time travel movie in SF/Fantasy is…”, or “The best romance novel in SF/Fantasy is…”. You can add a completely new question of your choice to the end of the list, as long as it is still in the form “The best [subgenre] [medium] in [genre] is…”. You must have at least one question in your set, or you’ve gone extinct, and you must be able to answer it yourself, or you’re not viable. I am deleting the second question and will replace it with something else. 2.) The best style of socks in leg-wear are: Knee Highs. 3.) The best innocent-sounding-but-not-so-innocent song in pop is: U and Ur Hand by P!nk. 4.) The best chick album in classical music is: anything by Bond. We have been trying to increase Stinkerbell's freedom. Her cage is not large and I do not want her to feel trapped in it or like being in it is a punishment. We feed her in the cage and her litter pan and water dish are there too, but I like to let her run around the house as much as possible. Last night was her first night getting to stay up all night out of the cage. We got home around 1am, couldn't find her right away and were very tired, so I decided to just let her stay out and see what happened. This morning I found my yarn bag dumped over and emptied. All the yarn was strewn in the direction of the couch, which is Stinker's favorite thing to hid behind. I had to move the couch to discover the blanket I've been working on - she had dragged the whole thing back there! Just now when I made her breakfast, she didn't seem too interested and instead disappeared behind the couch again. That's when I heard a rustling noise and some crunching. I pulled the couch out and there she was, her entire front end inside a bag of Doritos. I do not know where she got them, but she was happily munching away. It's 6:00am on the dot. 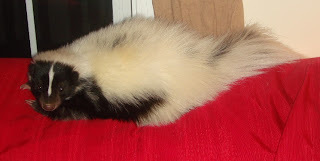 There is a skunk sleeping very sweetly in my lap. I am going back to bed. This is not an hour that usually exists in my world... but my almost-husband got out of bed at 3am (I woke up) to get in the bathtub because he was having chills. I woke up at 3:30 and realized he was still in there and of course was sure he had drowned. He was safe but shortly after getting out of the bath he re-filled the tub with his dinner. We just spent two hours on the couch letting animals have their therapeutic way with him and teaching him to breathe the square. I guess this is a time when I am thankful I have had to learn some self-calming techniques. Backstory: Andy is my co-house-owner, ex-roomate of 2+ years and Man of Honor for the wedding. Goombay is the first part of Fantasy Fest. It takes place on Petronia street, blocked off from vehicles and lined with food and craft vendors. "Goombay is a form of Bahamian Music and a drum used to create it. Its most famous practitioner in modern times was Alphonso 'Blind Blake' Higgs, who performed at the Nassau International Airport for many years. Goombay, also spelled gombey, is a form of Bermudan music, drum and dance, and is related to the Bahamian style." I picked up Andy from the Miami airport at midnight Thursday night and we stayed in a local La Quinta. I had worked a full shift at the store before driving to Miami and was quite tired, but we still stayed up until about 2:30am catching up. At 3am my phone declared a text message. Again at 3:30am. At 7am, Andy's watch alarm went off. I thought I had turned it off but it screamed again at 7:05am. At 8:30am the cleaning crew knocked loudly on the door (despite the fact that we had placed the "No Moleste" in the key slot) and actually opened it as far as the bar lock would allow. At 9:30am I received ANOTHER text. When my alarm went off at 10:50am I wasn't rested but got up anyway as we had to check out by noon. My sense of direction is pretty good and I aimed for where I believed the turnpike to be. I was right on and we made the short hop to the Kendall area of Miami. We hit Old Navy, Michaels, Barnes & Noble, Macaroni Grill and then to the Dadeland Mall for Nordstrom. Once we traversed side roads and made our way to Homestead (by way of the Miami Speedway) we got on US 1 and headed for Key West at about 4:15pm. Even stopping for beverages and bathroom breaks we made good time and arrived at home around 6:45pm. After about an hour and a half rest, we changed and climbed in the car to head downtown. It was starting to sprinkle as we pulled out of the driveway, but were undaunted in our goal to experience the smokey carnival atmosphere of Goombay. Downtown Key West is overrun with tourists currently and we were forced to park several blocks from Petronia. By the time we reached the festival it was starting to rain in earnest but as it is still very warm here, it wasn't uncomfortable. Our appetites were growing and we decided to press on through the increasing downpour to find a suitable place to eat. The majority of the crowd was beginning to leave to get out of the rain and we found a small overhang to hold our plates under while we ate. My sundress was soaked through but the short hair is not easily messed up in rain so we walked through the sheets of water and puddles at least 3 inches deep. Once we reached Duval again we decided to find a place to dry out that was not air-conditioned and made our way to Kelly's. It took about 2 more hours to get dry enough to get back in the car. I realize that there is a possibility that some of my readers may think that I don't want them to come to my wedding. This is not the case. For those of you I've never met, I doubt you're expecting an invitation in the first place. Those people that read my blog that I actually know, will not only be invited but expected to come (unless you live too far away and can't feasibly attend). I think that the problem will probably fix itself, considering the number of yes and maybes in my database totals 260 at most. More than likely 50% to 75% of these people will attend the wedding (130 to 195) and 80% of them will actually attend the reception (104 to 156). I am getting married in April (I was going to say "We are getting married in April" but didn't want any of you to think I'd gotten you into something you're not ready for...). Scott and I both have a large number of very close friends and family. We chose our reception location and it will only hold 120 people (Yes, it is a separate location from the ceremony, but the same day). I even asked if they actually count the guests and the answer was yes. Is it remotely tactful to invite some people to the reception and not others? If so, how do I choose? I enjoy taking pictures. I do not claim to be a photographer however, and with friends like Jim that have photography as a "hobby", I won't even claim that much. Here are some favorites I've taken. Maybe you will enjoy them as much as I do when taking them. If not, it's ok. I won't be a pistil. About three times a week I take Stinkerbell to work with me. She sleeps most of the day and I would rather that she be sleeping where I can give her some attention than at home alone when Scott is at his second job. 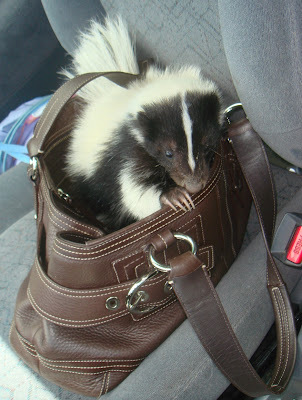 It's easier than you might think to transport a pet skunk. I'm sure Scott did not anticipate the many ways I would use my expensive Christmas present when he was picking it out last year, but it's the perfect size. I had the day off today and enjoyed every minute of it. I started off by sleeping in until about 9:30am. Truthfully, that's getting up early for me, since I get up at 10:30am on work days, but I went to bed at about 10:30pm last night and had plenty of sleep by 9am this morning. I took a beautiful 45 minute drive up the keys to Nadine's salon and enjoyed a manicure and pedicure that lasted about two hours - it was absolute heaven. I have had acrylic nails for almost ten years, with only a few months off here and there to let things "breathe." I've had my natural nails for almost 5 months and finally had acrylics put back on today. She painted them a pearlescent orange and put little orange stones on the tips of my ring fingers. I feel very pimp, and October-Appropriate. After driving home I took a two-hour nap with the cats and the dog and then I took a quick trip to the grocery store. I invited my bosses over for dinner tonight and we had 3 courses. Salad, Macaroni and Cheese, and Key Lime Pie. The macaroni recipe is my paternal grandfather's. It's been pretty popular whenever I've made it in the past, so the decision to have a full on salad course was to keep us all from gorging ourselves too much on the mac. 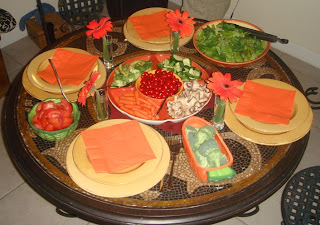 Not only did I make a real dinner, I bought flowers at the grocery store and did some very martha-esque arranging. 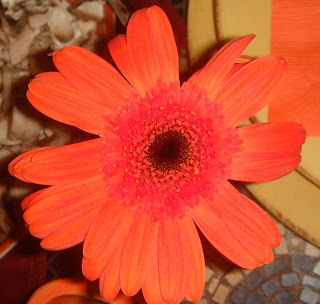 Individual orange gerbera daisies went in four tall shot glasses, and two small arrangements of red gerberas and orange mini-roses are sitting in two wine glasses. We've done a decent job at keeping our house presentable in the last week since my cousins went back to Orlando, here's hoping it's a trend.